Grip is a throwback to another era—specifically, the late-'90s and early-'00s. It's an attempt at a spiritual successor to Rollcage. You can tell all this from the above trailer; partly because it features the big-wheeled vehicular combat of the Rollcage games, but mostly because it transitions from Strauss's Blue Danube Waltz into drum-'n'-bass. That's not something you often see here, in the space year 2015. It's most definitely a faithful-looking recreation of Rollcage's arcade, wall-driving action. That's probably because members of the original team are helping develop Grip. 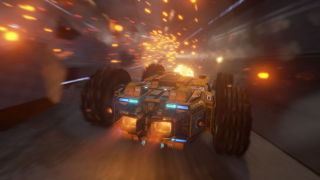 Currently on Kickstarter, Grip is hoping to raise for $657,000 CAD. There are 22 days left for the project.